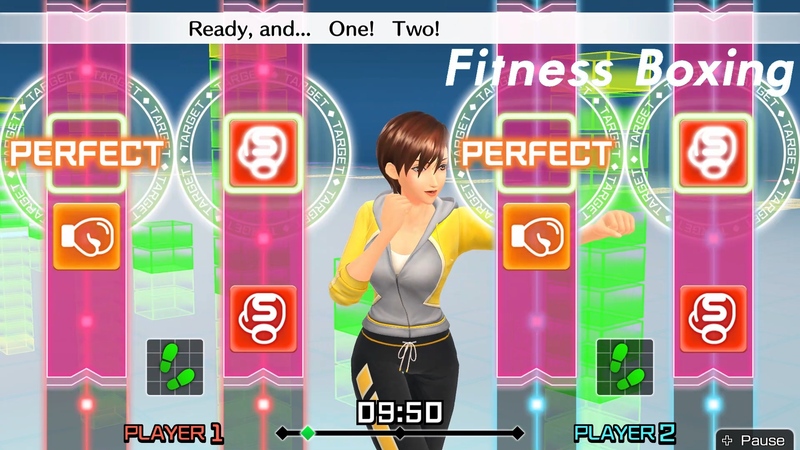 It wasn’t the fitness game we wanted, but thanks to Imagineer, Fitness Boxing was the exergaming game we got and despite its faults, it’s actually a pretty great title. I might not have lost any weight whatsoever in the last 20 days I have spent playing it, but I’m in no rush to quit playing it and since I have invested more than 30 hours into Fitness Boxing already, I feel it is now time to talk about the things that would have made this good fitness game into a great fitness game. Let’s begin! One of the biggest complaints that most critics had with Fitness Boxing, is the game being a little light on features. It might not be excessively packed, but for the most part, there is more to it than initially let on, but one feature it is sorely missing is better record keeping. Yes, there is a calendar that will keep track of how you have performed on any given day you worked out, and it will even give you an idea as to when you can earn your next in-game reward and your overall performance, but it would have been nice if the game had a full on records section that enabled players to keep track of everything they’ve done. Sure, it counts the punches thrown, but there are seven different kinds of punches you can throw (body jabs, body hooks, body uppercuts, jabs, straights, hooks and uppercuts) and it would have been nice if they could be counted separately, and also have the likes of every duck, weave and steps registered as well. It might not seem like better record keeping is a much needed feature, but it would enable the player to keep track of everything they’re doing more extensively and it could also keep track of how many times they missed a cue or got an OK instead of a Perfect, as well keeping track of the stars earned. Believe it or not, but Fitness Boxing does not support screen capture. It is one thing to not allow players to use record 30 seconds of gameplay thanks to video capture, but the lack of screen capture is mind-boggling. Being a fitness game intended to make players sweat and put them through their paces, on days where players feel the burn and give it their all, it would have been nice if they had the option to take a screen capture of their progress so that they could share it to social media if they want. Players don’t even have the option to take a picture of their favourite instructors in the new clothing items they’ve unlocked for them. We can take pictures of Mario wearing a wedding dress in Super Mario Odyssey, but we can’t take a single picture in Fitness Boxing? Really? Talking about clothes, although I am fond of the game encouraging players to throw a set amount of new punches, to get a new top and bottoms (trousers, shorts or skirt, depending on the instructor,) the problem is, unless you choose to play seriously and do at least two hours every other day, it could take anywhere between two and a half months to a year, just to get every outfit for all six instructors. I personally don’t mind putting the time in to make that happen, but for the players who are more inclined to play as and when, it would be nice if some outfits could be made easier to obtain, so as to reward part-time players for returning and feel more inclined to keep playing. I’m going to just come out and say it, the selection of music in Fitness Boxing is atrocious. There are 20 tracks in all and while most are chart-toppers and songs to get people moving, if you’re not into pop, you’re certainly not going to enjoy the likes of Moves Like Jagger, Stronger, Sugar, Girlfriend or All About that Boss, not when some exercises will have you listen to them for fifteen minutes. What makes it worse, is because there are only 20 songs when you have spent the likes of thirty hours playing the game, you will have heard the songs so many times that they become incredibly tiresome. Sure, to counter this you can always mute the game and just listen to a playlist you created on your phone, but then you’re draining the battery on your phone and the in-game music selection is still poor and nothing is getting improved. Admittedly, while my suggested improvements could be considered more as minor hang-ups, I definitely think its small changes such as them that could have helped Fitness Boxing make more of an impact with critics and those who choose to pick it up. They also would have helped justify the game’s price-tag. Still, that’s just my opinions on this matter, if you have some of your own you’d like to share, go right ahead, that’s what the comment section is for and if you wish to know more about the game in general, click here to check out our definitive review that leaves no stone unturned.